Thanks to Stan Lee and the NHL, every team now has a superhero that represents each franchise as a way to appeal to kids of all ages and identify them with the team, and not necessarily the players on the team. Closely resembling McDonalds and their 'playground' tactics, this is probably one of the stranger things the NHL has done to attract kids into the sport. Not sure what it has to do with hockey, but I am sure on January 30 they will explain everything. 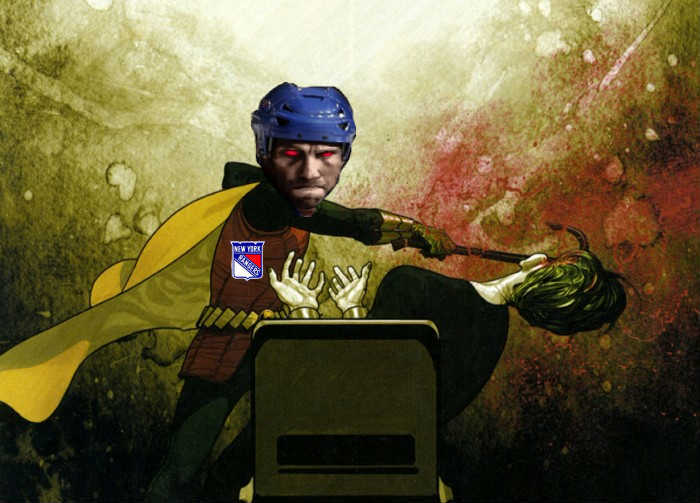 The only true evil are the guys I can think of are behind making this deal for the league (i.e. 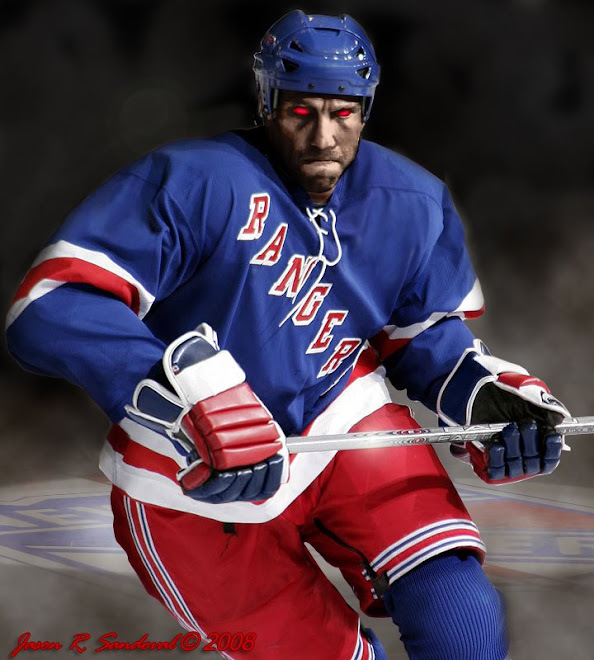 Dolan, Bettman, etc...) Truth be told, maybe the NJ Devils and NY Islanders could use a real-life superhero at this point in the season - the Atlantic Division could grant them this handicap. Well one thing is for certain - our name lends itself to creating a superhero. The Ranger. Easy to remember. Has a fighter adjective built into the name. But what happens when you are the Maple Leafs or The Islanders??? Hilarity. This is all Stan Lee could come up with? Sad that THE DARK RANGER was the original unofficial superhero of the New York Rangers, but we accept the new guy in town and understand that it's time to move on. Though, we'll stick with the bad photoshops and hold our heads up high! 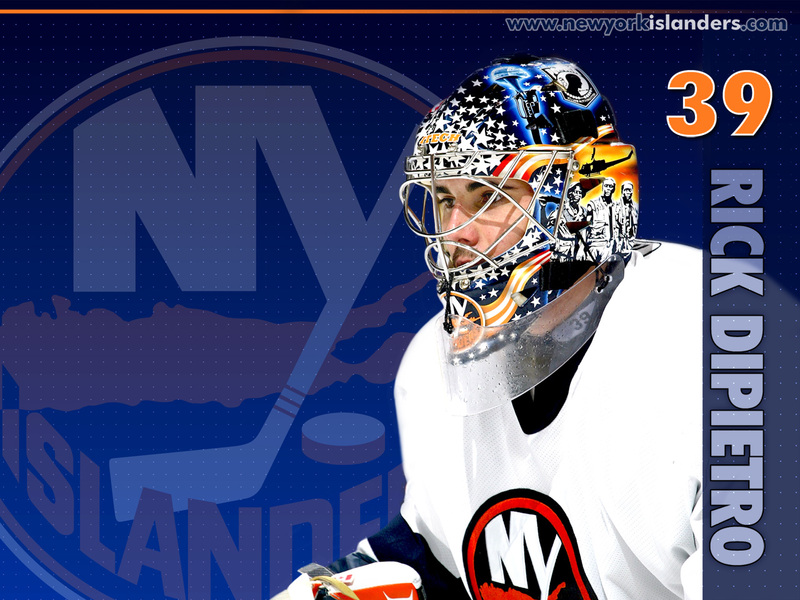 The Islander fans can't be happy with that! Haha! I think the DARK RANGER could take them all! *Facepalm* Stan Lee should be beaten to death with a my little pony coloring book. Hover horse, wtf?!? Any superhero would rather be stuck in a crowded subway car, than be seen on that thing. Kind of funny that a would be NY superhero has a vehicle that looks like a vehicle that has been stolen, stripped and left to rust under an overpass. What the hell is he wearing? the next even tighter shrink wrap edition of the tear away Reebok crosby endorsed jerseys. Why does it look like a football jersey? 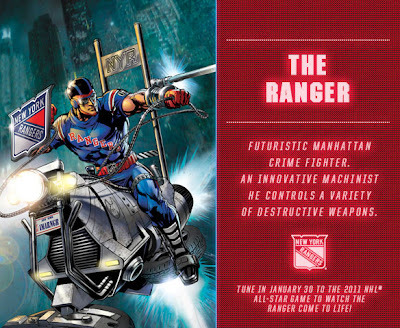 The idiots at NHL and marvel need to leave well enough alone. ..AND 'WHAT UP?' with that Maple Leafs hero. It's really a bitter old oak tree. I would have preferred to have a walking bottle of pancake syrup with arms and a ray gun that makes you cheer for your team when you lose! 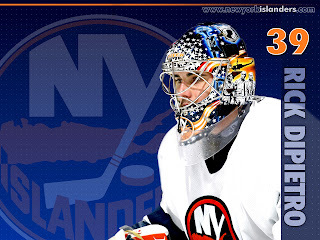 They could have at least put Rick Dipietro on a deserted IR island too...so not original. I too would have preferred the walking bottle of syrup. Villains would make a part time hobby of kidnapping his love interest, mrs. butterworth to get the upperhand.